Simon and Peter show how it's done! 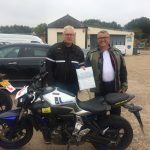 So just 3 days to a full DAS licence for Simon Crafter of Brighton, and how lucky were you with the weather too, just look at the sunshine, not bad for an autumns day, and perfect for an autumn ride round Sussex! Spot on Simon, enjoy the ride without the nagging from here on in! And Peter Tong of Lingfield, also showed us how it’s done on a great mod2 ride resulting in his full licence, now off you go, you have a Christmas list to write, and there’s so many bike shops out there just waiting to welcome you lol!